Jeopardy! champion Ken Jennings is interviewed by TV Time Machine host Jim Benson about his incredible 74-game winning streak on the classic game show. In this journey on the TV Time Machine, we ask you listen as we form all of our answers in the form of a question, as we go behind-the-scenes on the classic TV game show Jeopardy! In this edition of our program, we are proud to welcome to our program legendary Jeopardy! Champion Ken Jennings. Mr. Jennings’ incredible 74 game winning streak on the venerable game show is the stuff of legend, the television equivalent of Joe Dimaggio’s 56-game hitting streak, a feat that may never be matched. 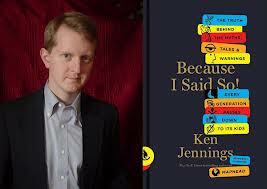 Over these audio segments, Ken Jennings helps us explore virtually every aspect of his incredible experience on Jeopardy!, including some of the secrets that enabled him reach such grandiose heights of glittering game show glory, while also discussing his funny, entertaining and enlightening book, Because I Said So!, The Truth Behind The Myths, Tales and Warnings Every Generation Passes Down To Its Kids. Again, for those of you intrepid enough to put yourself in Jeopardy, feel free to grab your buzzer, as we slip away from a questionable past, to experience a present, with all the answers! In this segment, host Jim Benson and Jeopardy! Champion Ken Jennings talk about his years growing up in South Korea, and how watching Jeopardy every day as young lad set the stage for his future game show fame. Mr. Jennings also discusses how he absorbs knowledge, his love of maps and trivia, and his experiences participating with the quiz bowl team in college. 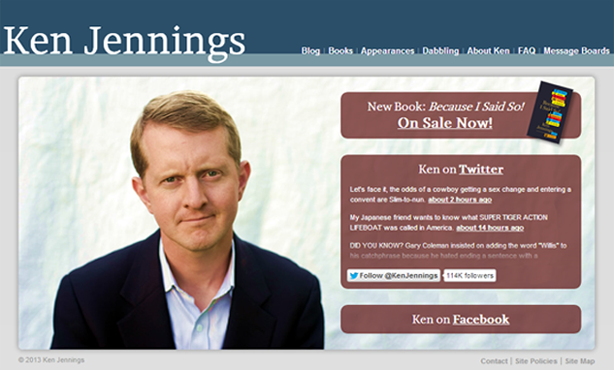 Ken Jennings also talks about auditioning for Jeopardy!, and how he prepared for his Jeopardy! debut, both in terms of buzzer and knowledge practice. Our Jeopardy champion also discusses what it was like during his first Jeopardy! contest, his concerns going in, and how he felt as his life-long dream was finally becoming a reality. For the final segment, host Jim Benson and Jeopardy! champion Ken Jennings talks about how his 74 game winning streak finally came to an end on Jeopardy!, and the primary emotion he felt as he realized that this was the end of the game show line. Mr. Jennings also discusses his book, Because I Said So!–The Truth Behind The Myths, Tales and Warnings Every Generation Passes Down to Its Kids. Our author talks about whether the following is true or false: compound interest will make you rich, most body heat escapes through your head, chicken soup is good for colds, chocolate is potentially fatal to dogs, and chewing ice is bad for your teeth.